Today, is day 4 of the party prepping. I have decided to devote it to pictures. My dad has always been a huge fan of enlarging photos. One visit to my parents house and you will notice the poster size pictures that are hung around the entire house. I went around his house and counted the number of photos my dad has enlarged. As of today, April 30th 2013, he has 41 enlarged framed poster size photographs. F O R T Y - O N E !! Normally when you frame photos for hanging around the house, you pick the best one. If you're going to enlarge a photo to 24" x 36", the photo is better than the best, otherwise why make it gigantic? My dad does not agree with that statement. There are many photos that one or more of us have scowls or are just not happy to be photographed at that moment, and he chose to enlarge them anyway. Sorry about that rant. My point is, with my dad loving photographs so much, I wanted to do something special with the photos I've managed to find of my parents. This involved going through many many photo albums and weeding through the thousands of family photos that are in there. I managed to find 200 photos of them where about 90% were just them. After scanning them, I wasn't sure what to do with them. Scouring pinterest didn't seem to help much. There were so many photos, I wasn't sure what to do short of a slideshow, and even then, it would have to be really long to add all the photos. Of course, I did have the option of cutting some pictures out of there, but this is 40 years of memories, I didn't want to short change them. Sometimes I stress out about trivial things, like photo collages. I finally decided on a photo mosaic. I took one of their wedding photos as the base, and using this great website, Easy Moza, I was able to create an awesome mosaic for them using all the 200 photos. You can download a hi-res photo of what you created for $5.95. Channeling my dad, I enlarged the photo to 24" x 36" at Costco. Make that 42 poster-size photos in his house now. So far I have tackled the centerpieces for the anniversary party and the samosas. Doesn't seem like a lot when I write them down, but they took up one day each! Monday was devoted to decorations. I saw this post on Pinterest and decided to replicate it. It's from meandmyinsanity.com. Out came the Silhouette machine again. I made the letters a little thicker than this, and I opted to not add their names to the banner. RAMAN & MRUDULA was a little long. So instead my banner just reads Happy 40th Anniversary. Figuring out where to hang it on the deck is a different story. I'll leave that part up to Chad. The Silhouette did a good job cutting the letters. I used some glittery paper I had. I just have random stacks of scrapbook paper for just such an occasion. I would hate to have a brilliant craft idea and not have the paper to back it up. Day 2 of the anniversary party preparation: Samosas. For those unfamiliar with samosas, they are little triangular shaped dough pockets filled with potatoes and peas or meat and peas. You'll find them in most Indian restaurants in the appetizer section. A few years ago I decided to master the art of samosas. They are a bit tricky to make, but like anything, all they need is a little practice. The trick to a good samosa is making sure you over season your filling. When you are making the filling, people usually put enough seasoning to make it taste just right, and then stop. But you have to remember that your filling is going to be masked with a lot of dough. So whatever seasoning you put in your filling, repeat it. Trust me. Of course, if you get it right the first time around, then great. But I always tend to under season the first time around in fear of seasoning overload, and then find myself having to add more in there. I formed the samosas and put them in ziplocs and stuck them in the freezer. I figure I can get them out of the freezer and into the frying oil the morning of the party. Hopefully. Othewise that's 100 samosas and a days work down the drain. Detailed directions on how to make samosas are coming. Promise. I have tentatively planned out my week of prepping for the parents 40th anniversary party. Today was devoted to centerpieces. I saw someone break down 10 years in the number of months, weeks, days, etc. and put in on a canvas. I decided to see what would happen if I tried to etch the breakdown of 40 years on glass. 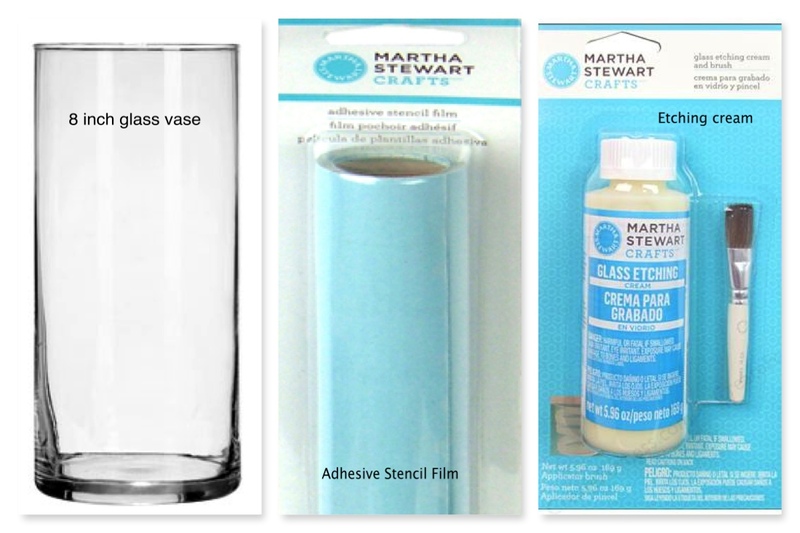 I bought 5 vases from the dollar store and the adhesive stencil film and etching cream from Michaels. Originally the film is $10 and the etching cream is $23. Kind of pricey, considering I bought the vases for $1 each. (But a little FYI, if you ever find yourself in Michaels about to make a purchase, always check online for coupons. Practically every week Michaels puts out coupons for 40% off one regularly priced item. I actually looked it up on my iPhone while I was in line, because they will scan the barcode right off your phone! 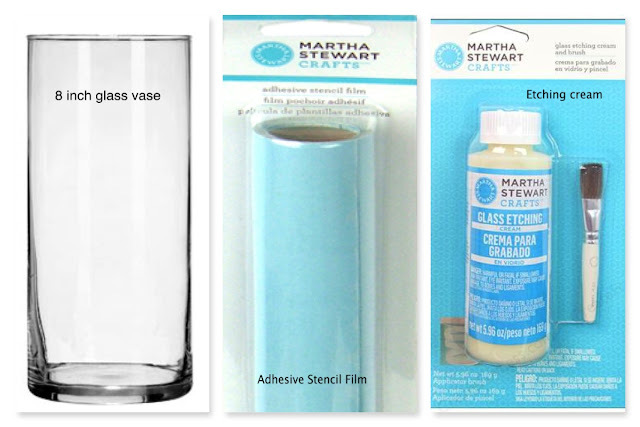 I got lucky because not only did I find the 40% off coupon, but there was an additional coupon for 40% off any regular priced Martha Stewart crafts. You'll thank me one day when you want to be crafty). I had recently bought a Silhouette Cameo. This is a machine that looks like a printer, but instead of ink, it uses a little blade to cut your designs. It's a pretty awesome concept, but I haven't had much time to play with it yet to truly see it at its best. I brought it out for this project. I cut out a 12 x 12 piece of adhesive stencil, made a stencil with the Silhouette and attached it onto the vase. The only problem with the stencil was taking out the negative space for the letters and numbers and attaching it on the vase so that they would be able to be etched properly. I had to take out the little pieces with a tweezer and attach it on every o, e, a, 4, 6, 8, etc.... that was the most time consuming out of this project. The etching cream looked like caramel. The directions say to apply a thick layer on the glass and leave on for 15 minutes. Then rinse off. Not bad. I did notice I should've paid more attention to the consistency of the cream, made sure I applied the same amount over the whole thing. As you can see the 40 is a little splotchy. Well, I have 4 more to go, I'm sure it'll eventually get there. I did have a panic moment while the etching cream was setting. I had to make Chad double check my math and make sure that really was the breakdown of 40 years in months, weeks, days, hours, and minutes. Phew, it was. Overall looks pretty good. Some flowers in there, and we've got our centerpieces. We have decided to throw my parents a surprise 40th wedding anniversary party. Well it's more of a glorified lunch. 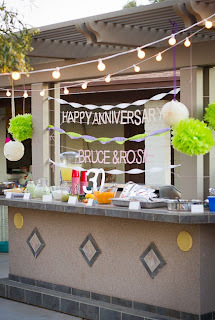 Throwing a party for something like this, I'm talking about a full-fledged Indian style anniversary party, would pretty much be like throwing a wedding reception. Unfortunately, we do not have the funds to do this nor do we have the time to pull it off. So instead, we decided to invite 40-50 people and have it on their deck. We went back and forth about the location, should we have it at a restaurant, should we rent a space somewhere? But with the dates and the short amount of time, we realized that it would be best to do it at home. It's set for May 4 at 1:30. That's a week and a half away. If this is really something we're going to pull off then I need to do some serious planning because it is right around the corner. Suddenly I feel overwhelmed. I need to make a to do list. Chad took me to see one of my favorite sculptures in DC today; only to find out that it is no longer in DC. 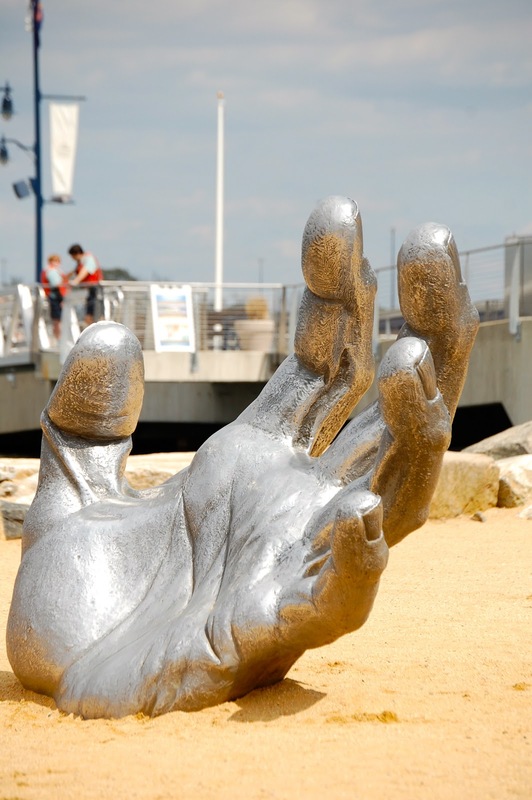 "The Awakening" had been located in Hains Point, DC since it's inception in 1980. After doing a little research online, I found out that the statue was in Hains Point on a temporary basis as part of sculpture exhibit in 1980. The sculptor is Mr. Johnson Jr, his grandfather was the co-founder of Johnson and Johnson. A few years after they placed it there, Congress passed a law "...requiring all public art on National Park Service land in Washington to be installed for a short period unless it was commemorative..."
That is interesting, but this was in DC for 27 years. Maybe the price was never right. The Awakening has now found it's permanent home in National Harbor off the Potomac in Maryland. They bought the sculpture for $740, 000 (according to the New York Times). It really is a great piece of work and I am not sure why I enjoy it so much. 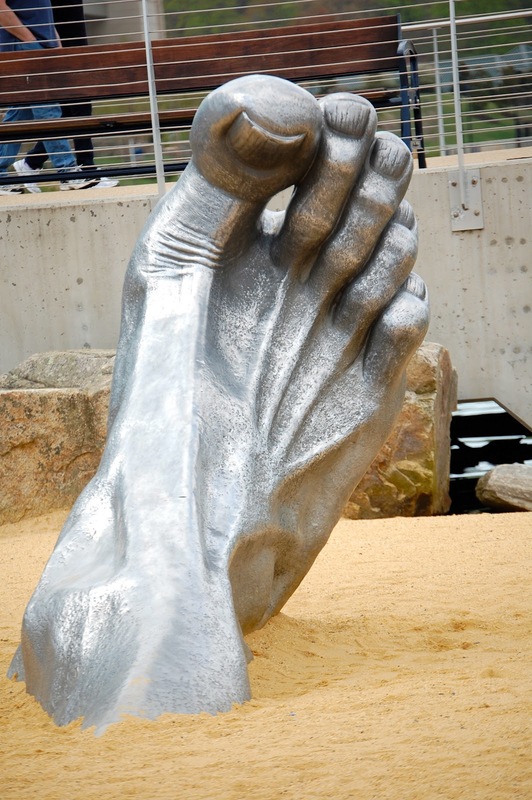 I know it's called "The Awakening" suggesting that this giant is actually emerging from the ground, but it's always seemed as though he was drowning. Something else I found out in my internet research: There is another exact replica of The Awakening in Chesterfield, Missouri. Apparently they liked it so much, they commissioned for it to be in the center of their town to attract tourists. This is the first glimpse you get of the statue when you are walking down the stairs at National Harbor. Even Chad was in awe. I will leave you with this very detailed sculpture outside of the Italian restaurant there. Poor turtle. You can find the full article where I found a lot of the tidbits here.